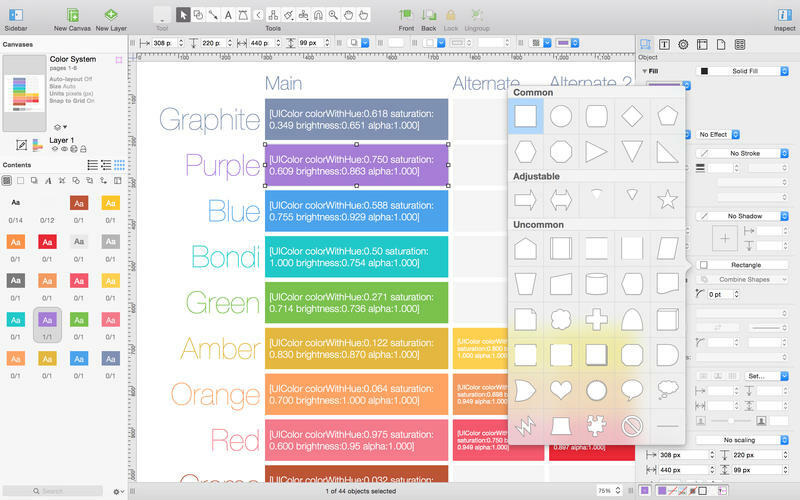 OmniGraffle Pro 6.5 – Create diagrams, flow charts and more. OmniGraffle Pro helps you draw beautiful diagrams, family trees, flow charts, org charts, layouts, and (mathematically speaking) any other directed or non-directed graphs. We’ve had people use Graffle to plan plotlines for a story, make an overview of an operating system, show the evolution of computers, and even show how diseases can spread in a closed population. If you want to organize your thoughts, your projects, or even your friends graphically using boxes and lines, OmniGraffle is your tool. OmiGraffle Professional has all of the great features in 6.0, plus a powerful toolset for advanced document creation and editing options. For the pro user who’s looking for an in-depth diagramming application that’s still priced below the competition, you’ve come to the right place. The ability to submit your stencils directly to stenciltown.omnigroup.com from within the application has been added. Ivory Coast and Ghana as well as the capitol of Nevada are properly named in their respective notes. Fixed a bug where it was impossible to edit a copy of an existing stencil. Fixed a crash when using the Find and Replace panel on a shared layer. Fixed a potential crash when converting vertex points to Bézier. Next story Polarr 1.2.0 – Lightweight and professional photo editor. Previous story Adobe Premiere Pro CC 2015 9.2.0 – Digital video editing tool. WireframeSketcher 4.7.2 – Create prototype desktop, Web, and mobile apps.